Our revolutionary menu finder provides the most comprehensive database of restaurants and nearby menus, with unprecedented searchability. 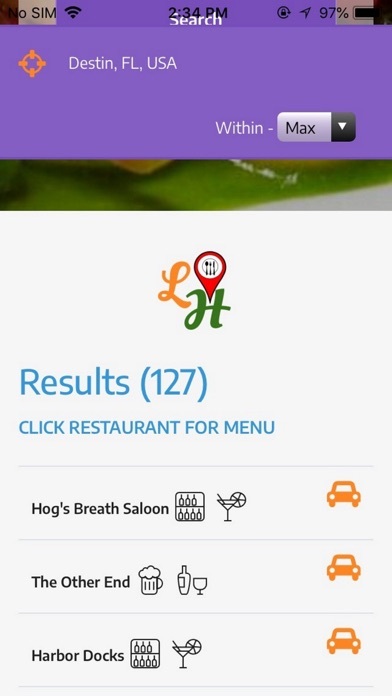 Users select the cuisine, their desired course and/or the dishes they are craving and Locate HappyPlate returns the matching nearby restaurants as well each restaurant’s current menu. Locate HappyPlate is highly efficient as both a restaurant finder and a menu finder, and now has the added feature of restaurant alcohol availability. Now you can know ahead of time if a nearby restaurant has a full bar, beer and wine, or no alcohol available. The Locate HappyPlate restaurant and menu finder is like having a personal dining concierge at your fingertips. One of the most convenient features is the speed at which the menus and nearby restaurants are accessible. 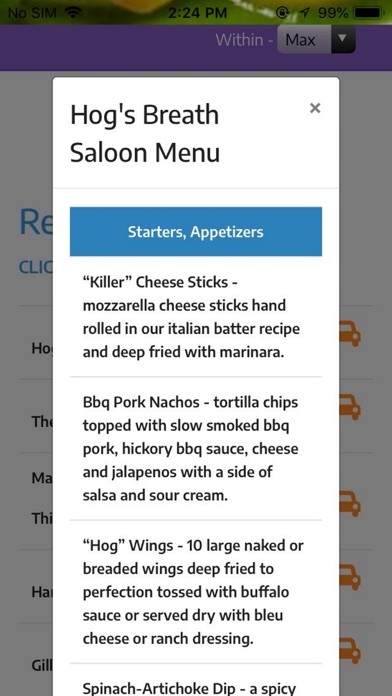 Users have access to nearby menus much faster than going to websites and clicking on their menu or searching the internet. 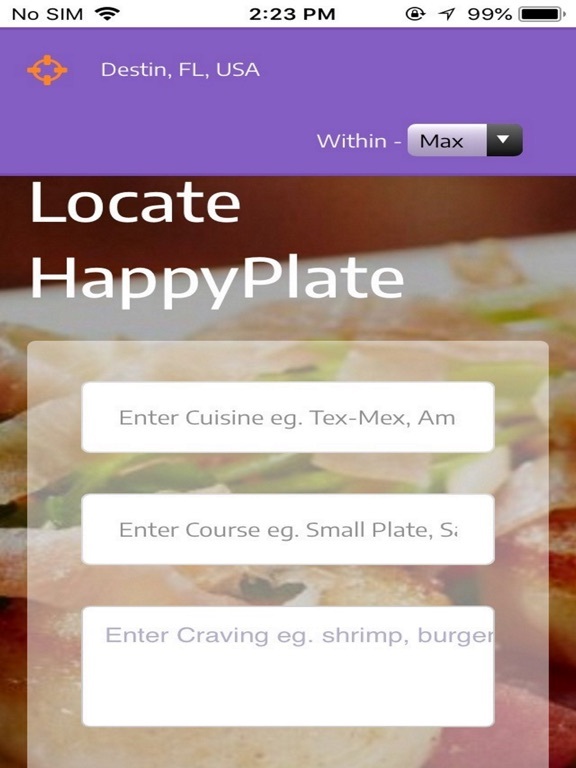 Locate HappyPlate is a convenient app for everyone in the continental US, and is very useful in situations where everyone is wanting something different to eat. Just input the food that each person is craving and the app will not only show you the nearby restaurants that can accommodate all of the requests, but Locate HappyPlate also displays the restaurant’s menu with the desired items highlighted on the menu. The app is a great time saver for vacations, as the user can find all nearby restaurants and their menus, both chains and local spots. Our system does not support or include reviews from any source, because everyone's experience is unique. We have all been to a place because of reviews and it did not live up to expectations at all, as well as been to a great restaurant and looked it up afterwards and to see it had a bad rating and bad reviews. Over 500 different restaurants, 78,000 locations, 25,000 dishes, millions of different dining option combinations and growing. Searching nearby menus has never been so easy! Our all-American teams verify all menus regularly to ensure that all menu options and locations stay up-to-date. Locate HappyPlate's menu finder database contains most of the national restaurant chains, and is currently adding regional restaurants to the restaurant finder. Our app data and development teams are working hard to add all of the local restaurants across the United States. The 9.14.18 update was the biggest yet with 365 restaurants added from the NWFL area, bringing the NWFL local restaurant count to over 800. Each restaurant listing has the menu and directions, plus the restaurant's alcohol availability. All cities from Escambia to Bay County including Pensacola, Gulf Breeze, Navarre, Navarre Beach, Milton, Crestview, Fort Walton Beach, Destin, Niceville, DeFuniak Springs, Freeport, Santa Rosa Beach, Grayton Beach, Seaside, Rosemary Beach, Alys Beach, Shalimar, Miramar Beach, Lynn Haven, Panama City and Panama City Beach are now represented.